Happy New Year, lovely ladies! Hope it’s off to a great start, and brings you and your families many of wonderful things: health, prosperity, peace, love, joy, excitement and lots and lots of style! The outfit builds from this versatile Banana Republic Dillon-Fit Floral Classic Blouse, which can be worn with skinny jeans, black leggings or pants, pencil or flare skirt or even a power suit. This fun Rosia Skirt by Meve from Anthropologie is another fun option for “Winter bottoms” – which can be paired with a flirty blouse, tucked-in sweater or tee. The pattern is very rich and opulent – great to warm up the cold winter months. 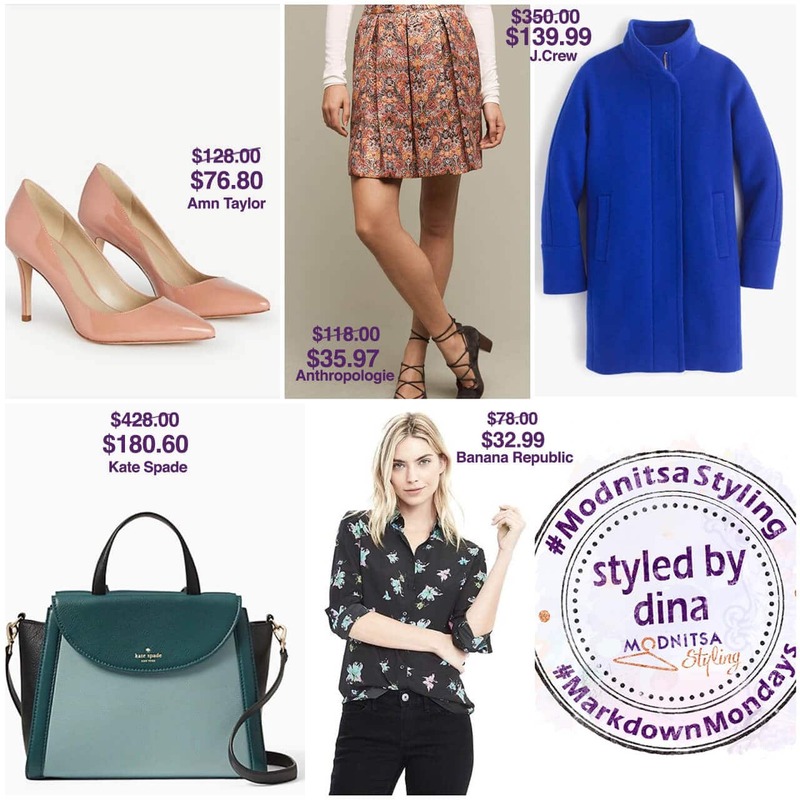 And of course, what’s a great capsule look without a statement coat – this stunning J.Crew Stadium Cloth Cocoon Coat in Deep Violet will brighten up any look – and is very slimming and flattering with it’s off-shoulder clean-lined silhouette. To polish off the style digest, I found these neutral patent leather Mia Heels from Ann Taylor. With their pointy toe, shiny patent leather in “deep camel” color, and 3 1/2″ heels, these will be your go-to shoes all season long. And of course a great pair of pumps deserves a structured bag best friend – this Cobble Hill Adrien by Kate Spade in “lakes edge/emerald forest/black” color combo is perfect for the Winter & Spring. What are your style favorites this season? Would love to hear in the comments below! And as always, if you’d like to schedule a personalized session with me, please don’t hesitate to reach out!